AdFest has unveiled its biggest ever line-up of creative, production and digital experts in the festival’s 22-year history. 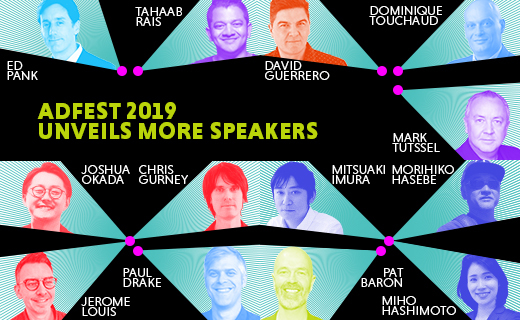 With over 30 speaker sessions, AdFest is also launching several new formats: the Breakout Stage will feature more intimate talks and presentations, while the Open Space Workshop area will feature highly interactive workshops such as ‘Speed Dating With the Juries’, which gives young creatives the chance to present their portfolios to AdFest’s 2019 jury. AdFest is also launching TMRRW Biz School, a creative business school for marketing leaders. This year’s program is divided into two streams: Craft@ADFEST runs on 20th-21st March 2019, and will be dedicated to exploring the latest production, digital, content and technology trends. Creative@ADFEST runs on 22nd and 23rd March and is all about creativity – the DNA of AdFest. The WARC Creative 100 is the successor to the Gunn Report – an annual ranking of global creative excellence. In this session, you’ll discover work from around the world from this year’s Creative 100. Come and be inspired and learn from the best. Where do we rest our faith and how do we stay relevant in such a fast changing world? Find out from Google’s Umma Saini, who was ranked No.1 Creative Director in India by Campaign Brief Asia and No.10 in the world by the Big Won Report – one of only two women on the list and the first Indian woman to feature ever. What can we learn about innovation from the world’s creative hackers? It’s time we learnt about creativity from those who aren’t brands nor agencies, says FP7 McCann’s Tahaab Rais, the most awarded strategist in the Middle East, North Africa and Turkey region. Through videos and anecdotes, he’ll inspire you with tales of people who create amazing work – without big budgets or timelines. David Guerrero will take you on a journey to explore the culture of the 7,641-island archipelago that makes up the Philippines and how it influences its works. Find out why it’s been getting more fun in the Philippines through the eyes of one of country’s leading creatives. If you’re curious to find out how Toyota, a 75-year-old automaker, is pivoting to be part of a massive shift in the way societies are developing and changing, don’t miss this session from ADK Singapore and Toyota Motor Asia Pacific. Together, they’ll explain how they are bringing to life the brand’s vision of mobility through the Tokyo 2020 Olympic and Paralympic platform across Asia. Morihiko Hasebe will lead a conversation with film master Mitsuaki Imura, last year’s Cannes Silver Lion winner, about his film SAKERU GUMI (“Long Long Man”), which keeps winning on the global awards circuit. “For those who want to make a great film ad, come and see him on stage. You will get the tips to make the crazier films that sell,” says Hasebe. This session will be simultaneously translated into English by Miho Hashimoto, Japan’s best-known interpreter. When brands embrace causes bigger than their functional promise, their “right to do so” will be questioned – as we have just seen with Gillette and the debate on “toxic masculinity”. In this session, Dominique Touchaud will explain how P&G brands solve this tension and show how brands can “do good” in a way that is good for business. As creative thinkers, marketers, innovators and problem solvers we spend our time and energy helping creativity play a meaningful role in culture and people’s lives. Join The One Club and its mission to make a difference in our industry, be it Inclusion & Diversity, Education, Professional Development or Gender Equality. By exploring some of the boldest work from the past year, D&AD’s Paul Drake will give you insight into some of the wider cultural trends that are driving creativity. Be provoked to draw on different reference points in future projects and consider what this could mean for your work in the year ahead. Do you ever wish you could go behind the doors of the judging room to learn the secrets of what makes some works great, and others exceptional? In the first of two live panel sessions, Dentsu’s Ted Lim will interrogate judges from this year’s Brand Experience & Engagement Lotus & Direct Lotus; Design Lotus & Print Craft Lotus; Film Craft Lotus & New Director Lotus; and Interactive Lotus & Mobile Lotus juries. BBDO Guerrero’s David Guerrero will lead a lively discussion with judges from this year’s Audio Lotus & Film Lotus; Branded Entertainment Lotus, Effective Lotus & Integrated Lotus; eCommerce Lotus & Media Lotus; INNOVA Lotus & Lotus Roots and Outdoor Lotus & Press Lotus juries. In this fascinating session, Mark Tutssel will explain, “Why instinct, alchemy and entrepreneurial thinking will win the creative future.” Tutssel wants our industry to be brave again, and is encouraging creatives to follow their gut instincts and act on their hunches. Tutssel is Executive Chairman and Global Chief Creative Officer at Leo Burnett Worldwide. AdFest 2019 runs from 20th to 23rd March at the Royal Cliff Hotels Group in Pattaya, Thailand. To purchase tickets, visit www.ADFEST.com.